Northrop Grumman / McDonnell Douglas YF-23A ATF. The YF-23A Black Widow II is a truly awesome aircraft in several ways. It was in competition with Lockheed Martin's YF-22 Lightening II ATF Program but lost out for reasons unknown. What we suspect is that Northrop are actually reserved for building and developing stealth aircraft but excluding Fighter Designs. This is because, looking at recent history of Advanced Programs, especially the Fighter programs, Northrop have lost all of these to Lockheed and other companies. Examples are the ATF program, Joint Strike Fighter Program, the Medium Weight Fighter program (F/A-18) and so on. But suddenly when Strike aircraft are involved, Northrop is well in, and their designs are magnificent. 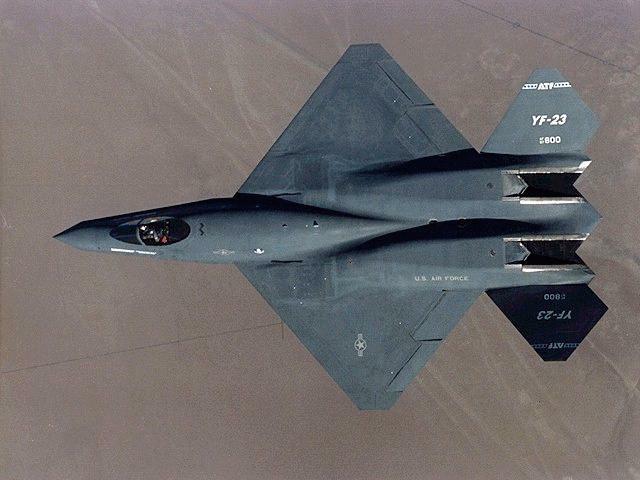 The YF-23 is such an example...a contender for the ATF that lost out to the YF-22 Lightening II (Now Raptor) but has been further developed probably into super-super aircraft with super capabilities. The Actual YF-23 is a Classic Fourth Generation Design of Stealth. The SR-71 was the first generation, F117 the second and the B-2 Spirit the Third Generation. The Black Widow II has some characteristics as the Lockheed SR-71, with long chines extending from the Nose cone backwards just like the SR-71 has. Its performance is phenomenal compared with today's fighter aircraft. The Length of the Black Widow is 67 ft 4¾ inches making it quite a large aircraft, just a bit longer than the F-117 and just shorter than the B-2a Spirit and about the same size as the F-15 Eagle. The actual shape is unlike any other aircraft seen, with a wing plan of a diamond! It is full of slender curves similar to the B-2A and blended into the fuselage that offers extremely good stealth characteristics. The complex design is designed so, because it allows the YF-23 to slide through the atmosphere at a very high supercruise speed, up to Mach 1.8 without reheat (burner) making it extremely fuel efficient and much faster than the F-22 Raptor. Its design also allowed extremely agile maneuvers without the need of Thrust Vectoring. Northrop went for stealth and survivability rather than Supreme agility with the aid of thrust vectoring having normal engine layout in the way of the B-2A spirit with Engine Exhausts on the top of the fuselage reducing significantly the below infra-red signature. Photo: Northrop Grumman. The YF-23A parked on the backside of the McDonnell Douglas F-15 Squadron hangar at Edwards AFB, CA. The shear awesome shape head on of this aircraft is shown here, with its Chines leading backwards to the wing root just like the SR-71. Its extremely massive engine nacelles dominate the overall head-on shape together with its uncommonly 45° all moveable tail-planes. It is designed also to slip through the air without the air friction common to normal fighter aircraft. The compound curvature and complex shape minimizes the Friction which causes extreme heat on the outer body which, with today's Infra-Red Search and Track Systems (IRST) fitted to Eurofighter Typhoon and the Mig29/Su27 variants air friction can in fact be seen. The Forward Fuselage was a complex modified double trapezoid with one above the other in mirror effect. The Rear section was built around the massive engines with the upper section dominated with massive engine nacelles each being a modified trapezoidal cross section as well. It was overall, a very complex design even though it did not look it from the outside. Northrop used extremely powerful super computers to design their aircraft, something Lockheed did not have when they designed the F-117 Nighthawk. Photo: Northrop Grumman. Flying over the Mojave Desert near Edwards AFB. This is one of two prototypes that now reside in California. One at Dryden and one at a museum. The Over-fuselage Engine exhaust outlets are clearly visible and dominate the back-end of the aircraft together with the engine nacelles. The unconventional layout of the cantilever wings is also clearly shown. Showing like mentioned above the overall length looks more than it actually is compared with the pilot. The tail-planes are very uncommon, being set each outward at 45° they are fully moveable and act as rudder/elevators. The engines are of the same design as the YF-22 Raptor being YF-119-PW-100 or General Electric YF120-GE-100 variable cycle turbofans with reheat. Each are rated at 32,000-35,000 Static Thrust. The YF-23 also has a very large weapons bay located right behind the nose Wheel location. The chines of the nose extend right back to the wing Root and leading edges giving it a very awesome looking appearance, and quite rightly so, this aircraft is a marvel and extremely awesome in every way. The Chines are used for controlling vortex of the aircraft at High angle of attack (AoA). To reduce the effect of the vortex on the tail-planes, the tail-planes are like mentioned set well back and at 45° outward canted. If tail-planes are induced to Vortex from the Wing, it can stall the aircraft (which is why the C-5 and C-17 both have T-tails). The Black Widow II Takes to the Air! On August 27th 1990 from Rwy 04 at Edwards AFB, the Black Widow II was the first ATF to take off and do flight tests. Northrop's Chief Test Pilot, Paul Metz was at the controls. Paul gently poured on the power and the YF-23A roared down the runway and after 4,100ft it took off by itself due to the extreme lift the aircraft body had. In the air already and flying down the runway acting as Chase Aircraft were Edwards based F-16 and F-15 Fighters and were to be the test flights chasers and safety aircraft. At 1,000ft and at 10° pitch up Paul reduced power to military thrust (without reheat). By this time, the F-16 was useless in performance already and the F-15 super fighter was finding it extremely difficult to keep up with the YF23A even though it still had its landing gear down and the F-15 was using reheat! Paul climbed to 25,000ft and began tests of basic systems and at this time, the undercarriage was then raised. He continued to do trials with testing of Yaw, Roll and pitch and then he went on to more complex moves such as constant heading side-slips, stick-flicks and doing structural measurements of the aircraft's airframe. He then commenced formation flying with the Chase F-15. During a 1.5g port turn the undercarriage door opened slightly and stuck there. Paul Metz flew with the F-15 so that the crew could check to see if the YF23 was ok, and at this time the flight had to be cancelled. Paul flew the YF23 for 55minutess,ending his test flight prematurely, but managed a Mach 0.7 speed and climbed to 35,000ft. Photo: NASA Dryden. 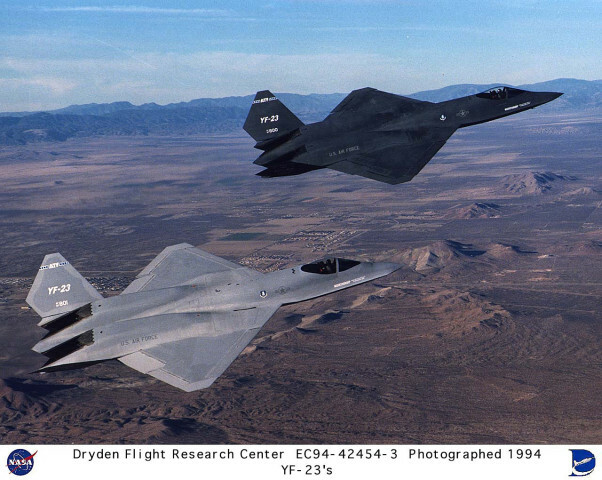 Showing the two aircraft built for the program and flying near Edwards AFB, the extreme shape of the YF23 is shown here. The gray colored aircraft shows the camouflage similar to the YF-22 Raptor. Black Widow II, more advanced than it should have been? There was no doubt the YF23 was extremely more advanced than any other aircraft to be seen, its avionics were top notch stuff and of course its performance was unmatched in supercruise and standard agility (without TV). 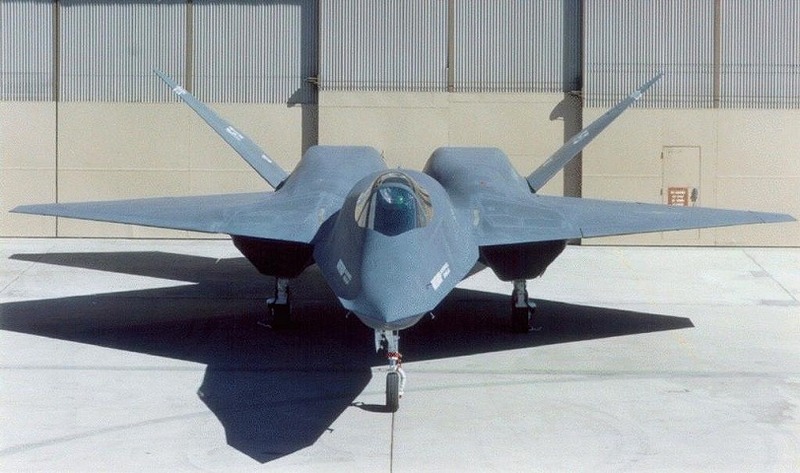 Did Northrop 'Over design' the YF-23A? Has its technology been used in other programs? The answer is yes, it came from the owners mouth: "The YF-23A continues to fly in some form or other"
Well he definitely spilled the beans! Northop have an advanced variant of the YF23 or with YF23 characteristics flying already, possibly at Groom Lake and possibly much larger and more powerful. The JSF concept was indeed based very much on the YF23 shape and layout and this too could be re-developed. Several witnesses at RAF Boscombe Down during the incident in 1994 say the aircraft involved did have similarities with the YF-23A. (SeeBoscombe Downs Black Day on this Site). B. Buschel of Lockheed Skunkworks was asked by Nick Cook of Janes Defence Weekly about his knowledge of AURORA. Buschel came out with "I believe that was the codename for the now Northrop B-2A"
He may be right and even he now says AURORA was Northrops and NOT Lockheed! something we researching the incident at B/Down found out a few years ago. With the YF-23A's phenomenal supercruise capability it was a viable program for something fast and stealthy used for the ASTRA (Advanced Stealth Technology Reconnaissance Aircraft). However this leaves us also with an option for the name ASTRA: Is Advanced Stealth Technology an advancement in actual stealth or is Advanced as in 'an advanced air-vehicle'? Northrop were indeed apparently and ARE using electrical devices to improve stealth on the Leading edges of the B-2A Spirit, is Advanced Stealth Technology this advancement? Or is it some other form very advanced technology that improves stealth beyond our imagination? We do know that the YF23 was a fourth Generation Stealth Design which was kicking in with the B-2A Third Generation design so it could have possibly been better. Has the YF-23 design moved on to Fifth Generation design? The Truth is only at northrop advanced projects division at Plant 42. However, recently looking at Langley Research Center photos we came across the SHARC, or Subsonic High Alpha Research Concept. The photos prove that NASA are indeed developing an air-vehicle with similar configuration to the YF-23 or should we say, the spin off to the YF23, the JSF Concept. With today's Stealth technology, in my opinion there is no need for extremely fast hypersonic aircraft, in a tactical way anyway there is no advantage except for running away. Subsonic is still a viable plan because being stealth there is no danger anyway except for visual reference but if you are stealth you try and keep out of visual I.D. In my opinion the YF23 is still out there, in a different form like Northrop had said and in a very much advanced state. More advanced than we imagine whether it be hypersonic, supersonic or subsonic stealth it does not matter. Like we mentioned, what use is an aircraft at Mach 6+? Apart from transiting it cannot do any tactical mission. If its mission profile is reconnaissance, at Mach 6+ there is no way to reliably take photos overflying the target. The only way possible would be to say... use a SLAR, Infra-Red Sensors or Electronic sensors from over 50-100 miles away so you can get a proper profile of the land. The only advantage like we said is 'running away' safely. Why be stealth and fly at MACH 6+? Flying at Mach 6+, well, there is no need to be stealth as there is nothing to intercept or strike you at that speed, you are safe as can be! It is a fact that 'most' of these exotic flyers are using conventional engine propulsion systems and NOT PDWE engines. There are probably only a 'few' aircraft developed with that technology flying for hypersonic research and development, the rest have conventional propulsion systems with afterburner and using ScramJet and RamJet technology 'maybe' using advanced fuel systems such as Liquid Methane Gas or JP-7 even. Others probably have advanced low supersonic, high subsonic engines maybe with or without reheat which is ideal and suited for Strike aircraft.